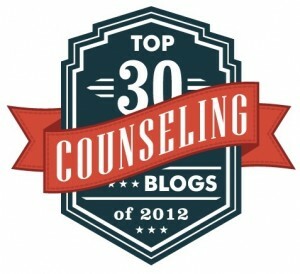 I am excited to announce that I found out today that the “Grieving Dads” blog was named one of the Top 30 Counseling Blogs of 2012. If you are interested in reading the list of “blog” winners, click here. I am honored to be considered one of the top grief blogs. Although I am not a licensed counselor, I am a Recovery Coach that continues to help people through some of the darkest days of their lives while searching for the light at the end of their very long tunnel. If you or anyone you know are interested in working with me as their Recovery Coach, please contact me either through email or phone number located on my contact page. I work with people from around the world and often use Skype as a tool to connect. Congrats Kelly! Thank you for your work! I was so excited to read this! You Rock! Thank you for doing this, and for noticing my comment on a Huff post article about childless flights. My husband needed your blog as a sounding board in the company of other fathers feeling the same pain. I can’t say we have enjoyed reading this blog :O who could? I can say that you provided what so many needed to keep them aware they are not alone or grieving “incorrectly” Your efforts are a wondrous tribute to your children and evidence their existence has made and continues to make you a better person. Way to make a difference Man! Great news, Kelly! It simply goes to show that one does not need to have finished his degree and obtained licensure to be a great counselor. Thanks for your courage and transparency to develop this blog and to keep it going. The grief of a dad is unique, and the many stories shared here have made a difference in my life – and I expect in the lives of countless others. Tim – You are welcome for the transparency, it’s also been part of my recovery. I am happy to create a place were grieving dad (and moms) can come and feel a sense of connection with others on this horrific path. Thank you for what you do for us grieving fathers! Your book was excellent and very insightful for a newly bereaved father. Thanks for your commitment. Very happy to hear my book was helpful to you. Congratulations! You certainly deserve it. I don’t know how I could’ve gotten through this process with the help of yourself, your website, and all the other fathers. Thank you for the note. I am honored that this blog has played a small role in helping you in your grief journey.